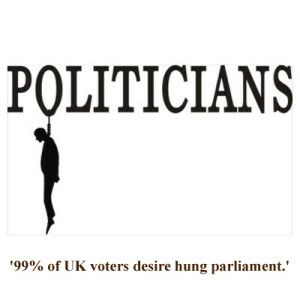 In the latest MORAY poll 99% of UK voters expressed a desire for a hung parliament after the general election with 100% of those questioned in the survey clamoring, ‘String the bastards up!’ It is thought that mass lying on behalf of moribund MPs combined with an ear-bruising, mind-mangling month long campaign have led to what pundits are calling GEF (General Election Fatigue) which in turn has produced the unsurprising poll results. This entry was posted on 1 May, 2015 in homepage and tagged current affairs, Ethan Harrison, politics, satire, Social commentary, spoof news. Bookmark the permalink.